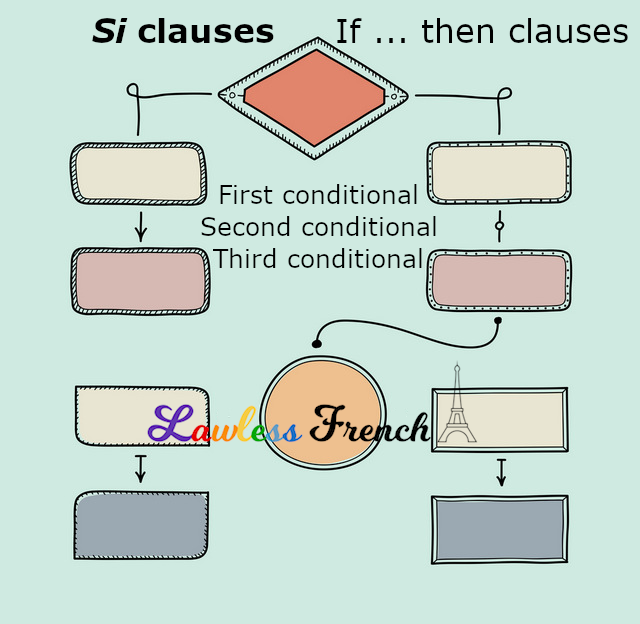 Si clauses, also known as conditionals or conditional sentences, are if-then constructions that express a condition to be met in order for a certain result to occur. They are divided into three types, depending on whether the condition is likely, unlikely, or impossible. Each type has a specific combination of verb tenses and moods – click for more details. 1) The verb combinations are very strict. In a conditional sentence, the present tense cannot be paired with the conditional, or the future with the imperfect. Memorizing these pairs is an essential task made easier by the fact that they are similar in French and English. If you’re tired, (then) go to bed. Si tu es fatigué, va au lit. 3) As long as si / "if" stays in front of the correct verb form, the order of the clauses in all three types of conditionals can be reversed with absolutely no change in meaning. Go to bed if you’re tired. Va au lit si tu es fatigué.